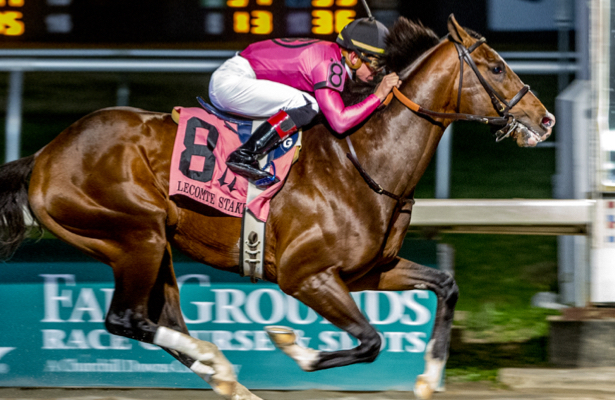 What a field it is for the Grade 2, $400,000 Risen Star Stakes, the first Kentucky Derby 2019 prep offering points on a 50-20-10-5 basis. Essentially, the Saturday, Feb. 16, winner at Fair Grounds punches his ticket to Churchill Downs. He will have earned it. An overflow field is entered led by War of Will, the Lecomte Stakes (G3) hero when the trail started a month ago. The Mark Casse trainee received a tough post position, a number of his rivals from last time are back, and a couple of shippers look to steal some valuable points. Here’s a glance at the Risen Star field with projected morning line odds by Horse Racing Nation. The race is carded as the 12th, with post time 7:02 p.m. ET. 1. Plus Que Parfait, 8-1 (Point of Entry — Brendan Walsh/Julien Leparoux — 5: 1-1-2): The Lecomte’s morning line favorite ran fifth, 6 1/2 lengths back of War of Will. There’s an argument to be made that he lost that one with a stumble at the start, but you can also debate that he benefitted from an off track when running his best race to date to be a close second in the Kentucky Jockey Club (G2). The rail doesn’t help here. Toss. 2. Roiland, 20-1 (Successful Appeal — Tom Amoss/James Graham — 5: 2-1-0): Seventh in the Lecomte, he did take money, bet down to 12-1 given he had two starts back beaten winners at Churchill Downs going 1 1/16 miles. That victory only looks better now with Limonite and Owendale in the Risen Star and Everfast a longshot runner-up in last weekend’s Holy Bull (G2). Don’t give up on Roiland yet. Board hitter. 3. Mr. Money, 10-1 (Goldencents — Bret Calhoun/Gabriel Saez — 4: 1-2-0): He came down with a cough the morning before the Lecomte and scratched, making this a tall ask off a layoff now stretching more than three months. Still, Calhoun didn’t have to choose this spot. He thinks highly of the Breeders’ Cup Juvenile’s fourth-place finisher, who tightened the screws Friday with a bullet five-furlong breeze. Use underneath. 4. Chase the Ghost, 30-1 (Ghostzapper — Dallas Stewart/Mitchell Murrill — 6: 1-2-0): He received only a so-so trip to be sixth in the Lecomte, offering no major excuses. It’s always tough to know when Stewart’s trainees are poised to strike at long odds, or if he’s simply taking a shot. This feels like the latter, though it’s a natural progression for a colt who broke his maiden at fifth asking when finally stretched out. Toss. 5. Henley’s Joy, 20-1 (Kitten’s Joy — Mike Maker/Manny Franco — 6: 3-2-0): Owner Bloom Racing Stable nearly took last year’s Risen Star with Snapper Sinclair, but the breeding for Henley’s Joy simply doesn’t indicate he’s a fit for the dirt. I’d expect him to take some money based on the level at which he has competed in prior races, but don’t take the bait. Toss. 6. Hog Creek Hustle, 12-1 (Overanalyze — Vickie Foley/Florent Geroux — 5: 2-1-1): The Lecomte runner-up passed a two-turn test in his last start and closed better than most any of his rivals that day on War of Will. Distance may help, and this post position suited him last time at Fair Grounds. To win against this bunch would be a surprise, but at expected double-digit odds, don’t leave him out of the superfecta. Use underneath. 7. Manny Wah, 12-1 (Will Take Charge — Wayne Catalano/Channing Hill — 8: 2-2-2): Connections were on the fence to move forward on the Derby trail after third in the Lecomte. He was somewhat of a wise-guy selection for that race but took it to War of Will and was really no match. Certainly there are pace considerations for him, but I don’t view him as a win candidate this time. Use underneath. 8. Owendale, 6-1 (Into Mischief — Brad Cox/Shaun Bridgmohan — 6: 2-1-1): This colt is just coming into his own as a winner last time over the well-regarded Gun It and Cornacchia at the allowance level. He was handled confidently that day in a field of six, so expect more adversity here. But lack of stakes running lines should mean a decent price for the likely pace presser. He runs with a similar style of War of Will and will do so from a much more favorable gate. Win contender. 9. Country House, 8-1 (Lookin At Lucky — Bill Mott/Luis Saez — 3: 1-1-0): Is this the year of Mott? He's lining up 3-year-olds lately to the point where he has to leave Florida with Country House, an eye-catching last-to-first maiden winner Jan. 17 at Gulfstream Park, where he absolutely blew the start but still won by 3 1/2 lengths with ease. The colt didn’t break quickly in either of his other two starts, and in such a big field, that makes him a play against for me. Toss. 10. Limonite, 10-1 (Lemon Drop Kid — Steve Asmussen/Brian Hernandez Jr. — 4: 1-1-2): The tactical runner either gets there or comes close on a consistent basis, and he was only a couple lengths behind the dueling Signalman and Plus Que Parfait last time out. Asmussen usually has them ready to go off the layoff, and this confident spotting with these connections, dare I say, is reminiscent of Gun Runner opening his 3-year-old campaign. Don’t overlook. Live longshot. 11. Dunph, 30-1 (Temple City — Mike Maker/Jose Ortiz — 4: 2-0-1): He won the restricted Spendthrift Juvenile Stallion Stakes with ease second out at Churchill Downs but hasn’t shown the sort of class needed to contend in open company when ninth in the Kentucky Jockey Club and third in Remington Park’s Springboard Mile. He didn’t offer much in the stretch, and I fear he’ll get used up here early. Toss. 12. Frolic More, 30-1 (More Than Ready — Dallas Stewart/Corey Lanerie — 5: 1-2-1): It was an encouraging effort last time as he ran 1 1/2 lengths behind Owendale, taking dirt along the way with the track drying out at Fair Grounds. The thinking here is this one is a cut below in terms of class with his maiden victory four races into his career and not over the best of Chruchill Downs’ fall meet runners. Toss. 13. Kingly, 6-1 (Tapit — Bob Baffert/Drayden Van Dyke — 2: 1-1-0): The Baffert factor isn’t one you often have to consider in New Orleans. Kingly, the full brother of Mohaymen, won his Dec. 1 debut, then ran second Jan. 31 in a first-level allowance in the speed-favoring slop. For Baffert to both wheel back and ship, Kingly must not have done much running that day. This colt has appeared a bit green in his works, but he does fit here and could serve as a major barrier to War of Will to his outside. Win contender. 14. War of Will, 3-1 (War Front — Mark Casse/Tyler Gaffalione — 6: 2-1-1): Welcome to a worst case scenario. War of Will has arguably impressed more than any Derby trail winner in the new year, yet the last-out winner of the Lecomte will have to overcome the outside stall here. Could connections look elsewhere for a penultimate prep? Casse tends to scratch when put in this sort of position. War of Will, who has showed decent gate speed in his two dirt starts, is a win contender, yet the post position also makes him a vulnerable favorite. AE. Gun It, 20-1 (Tapit — Steve Asmussen/Ricardo Santana Jr. — 3: 1-0-1): The $2.6 million yearling figures to draw into this field — it’s not often all 14 make it a whole week to race day — and he certainly has potential. That said, even in winning Dec. 22 at second asking, Gun It ran greenly. He was third to Owendale last time on an odd, drying track. Given the reputation, he’s likely still to be overvalued. Toss. Summary: So, who should I single? Jokes aside, this is the most diverse field we’ve seen on the Derby trail and one of the betting races of the year outside of the big stakes weekends. If War of Will goes, I see the pace heating up, and this race setting up for a closer of the likes of Limonite. The big question as horses come together so early in their careers is class. I’d advise taking some tough stands and giving a fresh look to horses eligible to move forward off a defeat. Maybe War of Will is a monster of a horse, but I’ll let him prove it rather than count on a heavy favorite from the 14 hole.